Hi there! Today we take a look at another one of the big players in the world of vaping, Smoketip. What you’ll come to realize is that SmokeTip is all about simplicity. Everything about this brand is purposely kept very basic, which should not be misunderstood to mean that they do not have a lot to offer. In fact, they have been able to stay strong in the market thanks to their impressive and satisfying vapor production along with their large variety of flavors. Their website gets right to the point but at the same time offers more than enough information to ensure that users are fully aware of what SmokeTip can offer them. While other brands are constantly working to be innovative and stay ahead in terms of technology and design, SmokeTip seems to work under the principle that if it is not broken, don’t fix it. As such, they continue keeping things simple without any major design overhauls. Simplicity is sometimes the road to greatness, and that is what SmokeTip is all about. Don't be fooled by the general appearance, try them once, you might never look back! Smoketip’s motto is to keep it simple and that is certainly reflected in their unit. There really are not that many moving parts here as the unit is made up of just 2 pieces. 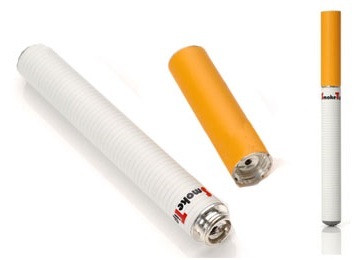 The main body of the cigarette houses the 3.6v battery while the “filter” holds the vaping liquid and atomizer. The nice thing about Smoketip’s design is that the atomizer is found in the cartridges. This is significant because, as any of you veteran vapers know, that atomizer is usually one of the first things to go. Because the atomizer on this unit is stored with the cartridge you will continuously be replacing the atomizer as well as the flavor packs. This ensures that your unit last longer than the conventional design with the atomizer in the body and furthermore does not add any cost to the cartridge refills. 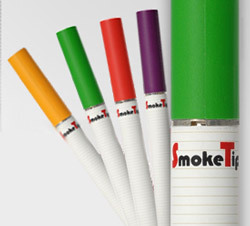 A recent innovation has seen smoke tip introduce colored batteries to add a touch of personality to your e-cig. Available colors include white, black, chrome, or pink and also have distinct ember glows. Another area where Smoketip really sets itself apart from the competition is with their batteries. Firstly, their standard batteries are 3.6v, long life, rechargeable lithium ion batteries and are located in the top part of the cigarette (ie: not the “filter”). These will last you anywhere from 3 hours to 3 days depending on your level of usage and are easily rechargeable either via the included wall adapter or by plugging it into a standard usb slot. But the part you can really get excited about is that the battery is 100% guaranteed for life! No, you didn’t read that wrong; if one of your batteries ever stops working, for whatever reason (barring user negligence) they will send you a replacement absolutely free of charge with your next cartridge order! While this is a fantastic promotion, in our experience we’ve rarely needed to use it. This is because they also offer free batteries with any purchase of 3, ten pack flavor cartridge reload. Additionally, if you were to order 6, ten pack flavor cartridges you receive a battery, wall adapter, and USB charger all free of charge. Add this to the two batteries you already receive in your starter kit and what this essentially mean is that through the natural course of buying vapor refills and added flavors you will almost invariably end up with more batteries than you’ll know what to do with! I actually keep several of these spare batteries in my car and at the office so that I’m almost never left without a charge! The batteries are also now being offered in a variety of colors so you can add a touch of customization to your vaping experience. 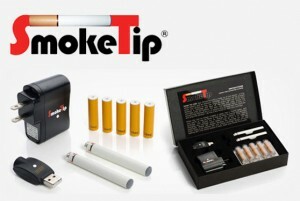 The vapor delivered by SmokeTip is thick and satisfying; most smokers will be very pleased with the strong throat hit. What is most notable about SmokeTip is the constant flavor delivered in the vapor until the end of the cartridge. The vapor production and bold long lasting flavor seems to be the best thing about SmokeTip e-cigarettes and it is likely the reason they have been able to continue to attract customers with simple marketing. This is in spite of the fact that they have kept a low profile and do not benefit from the ad dollars, marketing expertise, or technology that other companies have at their disposal. Overall, SmokeTip holds it’s own against the best e-cigarettes around in terms of vapor. While SmokeTip usually keeps things basic, the flavor department is the one exception to this rule. They count an impressive selection of flavors ranging from classic tobacco to pineapple and everything in between! As mentioned, the flavors are bold and outlast most of the competing cartridges on the market. There are 22 flavors to choose from in all: Tobacco blends (Regular, Cowboy, and Sahara), Menthol, Mild Menthol, Clove, Banana, Cinnamon, Watermelon, Chocolate, Vanilla, Almond, Grape, Peach, Cherry, Peppermint, Orange, Strawberry, Blueberry, Apple, Pineapple and Coffee. No matter what kind of sensation you are looking for there is almost certainly a flavor to suit your mood. The majority of the brands available in the market offer a variety of kits to suit all needs and budgets. However, SmokeTip has decided to offer just a single starter kit that contains the main accessories that you will need to enjoy their vaping experience. Some may see this as a disadvantage due to the lack of options but given the fact that the company is characterized for their simplicity, it could be said that they want to ensure that new vapers do not feel confused or overwhelmed when choosing a starter kit. Their starter kit costs $39.99 and contains everything you need. This kit was once priced at $59.99 but has seen the price reduced over the past couple years much to the delight of users. This is one of the few changes that SmokeTip has implemented and I think is a prime example of their user first mentality. When comparing this kit to those of competitors you will notice that there is quite a lot of value in this product. SmokeTip’s starter kit includes two rechargeable Lithium Batteries, one wall adapter, one USB charger and five flavor cartridges packed in a gift box. 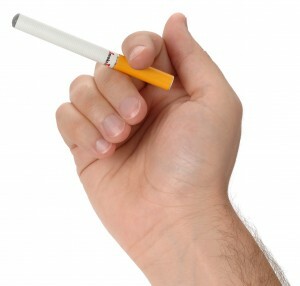 The e-cigarette itself looks pretty much like a regular tobacco cigarette. The batteries are slim which means that they are easier to hold and offer an even more realistic sensation whenever you take a puff. They recently introduced new battery colors (they are available in Pink, Silver, Black and White) to add variety to the appearance of their products. 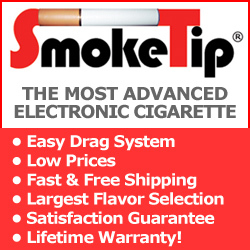 Overall and on the long run, SmokeTip has some of the most competitive prices in the market. They offer loyal customers a way to never run out of batteries at no extra cost. When buying replacement cartridges, you get the choice between 3 different deals depending on your purchase volume. With a 3 pack of 10 cartridges purchase, you get a free battery, but what’s really out of this world, is that if you buy 6 or 10 packs, you get batter chargers up to a full kit, at no extra cost! Additionally, the more packs you buy the cheaper they get. Each pack has 10 cartridges, starting at around $20 per pack and going as low as $15,97, I don’t know about you but I call this a steal, um I mean deal! Even though the brand is not strong in terms of innovation, the variety of their flavors and their lifetime battery replacement guarantee make them a great option for many users; particularly those making their first foray into the world of e-cigarettes. The fact that the price of their starter kit has been reduced is another great reason to give them a try.